Spain’s Supreme Court has upheld a final ban on the torture of bulls during the cruel “Toro de la Vega” festival, following years of pressure from local Spanish groups, including PACMA, and PETA. No young bull will ever again be stabbed to death by men with spears in the Castilla y León region of Spain. 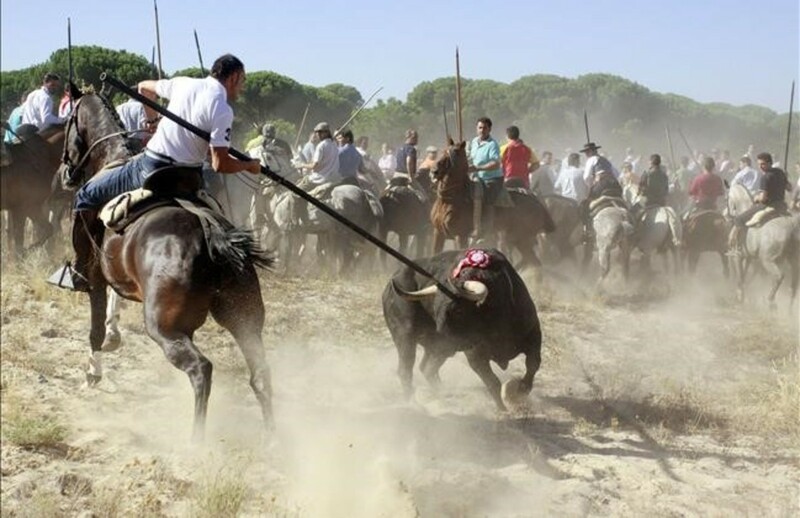 The Toro de la Vega fiesta takes place in Tordesillas, in the Castilla y León region of Spain, each September, despite the fact almost three quarters (74 per cent) of Spanish citizens aged 16 to 65 oppose the bull fiesta. During the barbaric event, spear-wielding men on horseback chase a bull out of the town and into the surrounding countryside. He is relentlessly pursued and stabbed with spears until he is cornered before being brutally stabbed to death. This victory is part of a wider movement in Spain, as more and more people are speaking out against events in which bulls are tortured in the name of entertainment. To date, over 100 towns have banned bullfighting. Even these bloody bullfests are subsidized by the EU, alone 150 million euros flow directly and indirectly from Germany into the bullfighting industry, 600 million euros is the bloodthirsty Tauromafia, which plunges the European Union every year in the cash. This EU subsidy insanity feeds and preserves the bull mafia.